There is almost unlimited quantities of quality information through an iPad when planning a trip or adventuring around town. There are sites you can access and apps that contain information to enlighten and help make decisions to turn left or right. Many of these solutions require an Internet connection to get to data. Services like Google Maps is very helpful, as long as you can connect and have time for the data traffic. 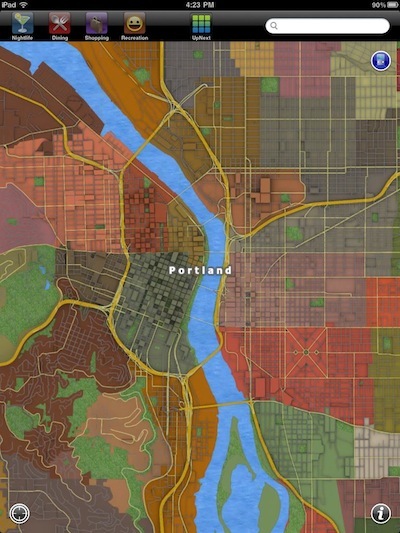 A city’s first view from UpNext 3D is an overview sized map. 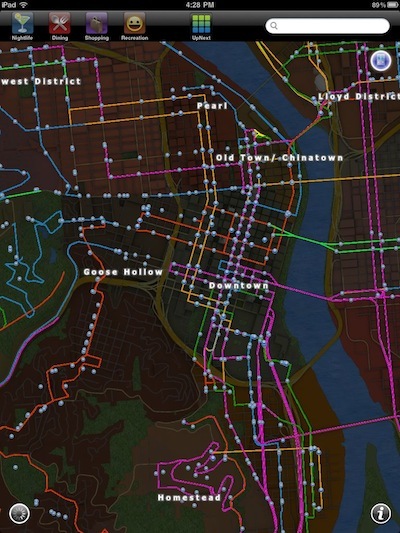 The view of a city can be seen for any map loaded without needing to be on location and without further Internet access. Tap on an area of interest to get a closer view. Any building can be tapped on to see what is in it. Each item listed can be tapped for more details… some levels of detail that changes often can require a Internet connection. We never found the need for that much data, we were just looking for particular landmarks within a building before we ventured in. Nice to know before you walk in to find your in the wrong building! Not sure what your looking for? Not a problem when in a UpNext 3D City. Zoom in and twist around using just two fingers to see buildings… handy to see what is around the corner and all around a area like standing there and turning around and around, except it is down with a finger on the iPad screen. 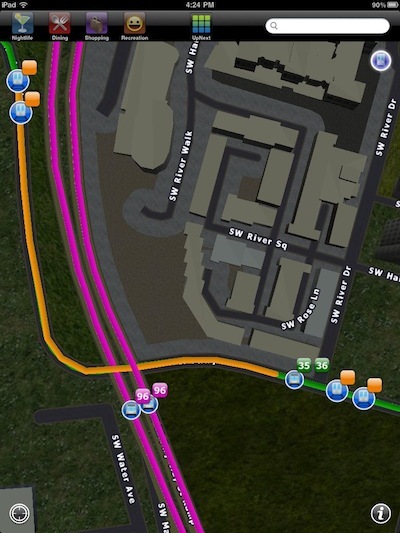 Mass transit maps are always available via the blue button in the upper right corner, toggle the informational overlay on/off with a tap of the button. If your not sure where you are, tap the GPS button in the lower left corner of the view. 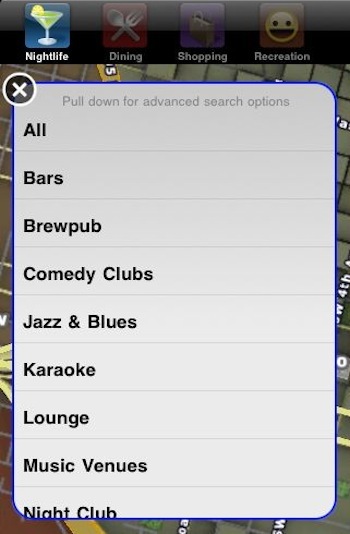 Zooming in close to a location is a single finger tap and out with a two finger tap. 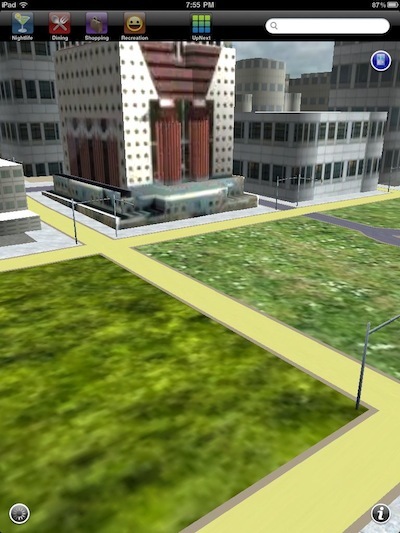 The screen pinch/expand work as well, but the tapping make for a quick zoom on any of the UpNext 3D City views. Here is a zoom into a place in town to see where the closest train stop was. All of the views can be twisted around to see at different angles using two fingers to twist. Moving your fingers on the screen up/down and side-to-side changes the view too. 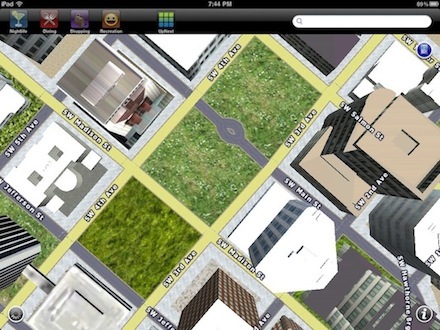 When going for a view of a building or the area around you, turn the iPad to landscape for maximum impact. There is icons across the top of the page for quicker access to key points of interest. You can either look around you with the on-screen view or choose a button. 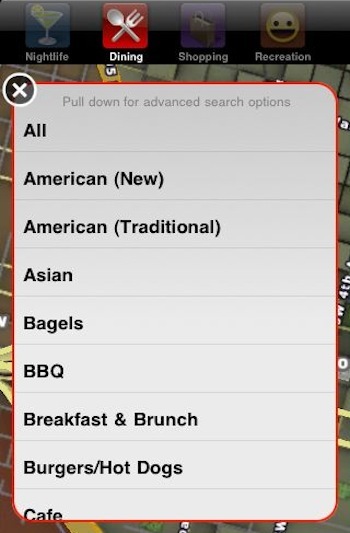 Each of the four groups can searched, view all the options in the category or drilled down to a particular sub group via a menu. 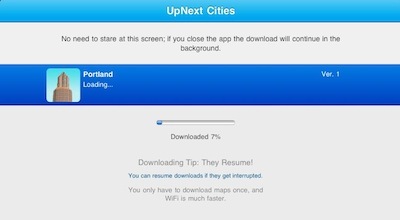 Within these selections, UpNext 3D Cities does offer reviews and people’s comments, these do require Internet access though due to the quantity and ever changing data. 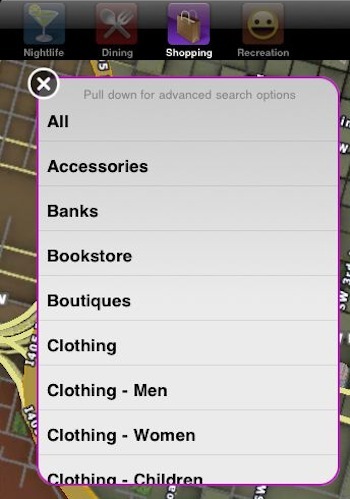 Shopping in UpNext 3D is pre-divided down for quick reference when ‘on the go’. We found this was a great tool when moving around town to find an ATM or particular clothing type without having to try to search by a particular company name. Dining is a hit with us. 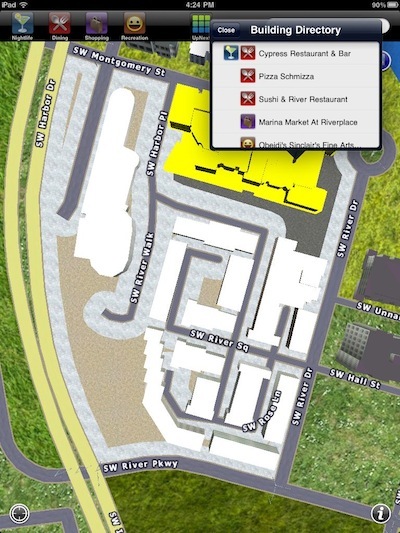 We could virtually ‘walk’ to the location and see what we would be passing prior to the meal. No more, ‘it must be one more block down’ or ‘wasn’t it next to a parking garage?’. Nightlife so you know before you go in or can track your planned evening hot spots before setting out. 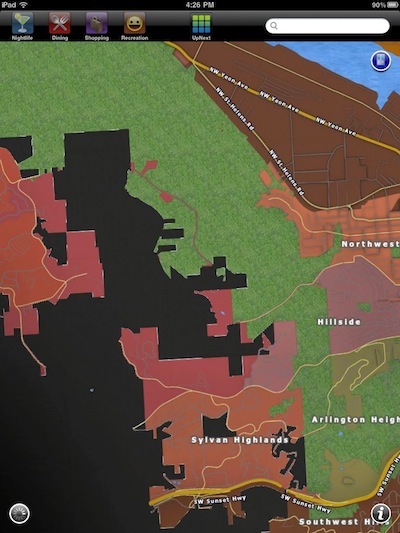 Not always needing to be connected to the Internet does mean that your map has to have borders to the limites of data you have stored on your iPad. Venture too far out of town and you drop off into the black void. 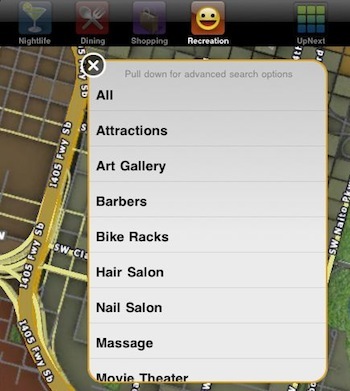 UpNext 3D Cities is just that, key cities and their important information, it’s isn’t a global map your trying to store. For us, cities like NY have just gotten a lot easier to get around and find out what we are looking at without the need to ‘always being connected’.